262 pages | 7 B/W Illus. The domain of international entrepreneurship has continued to gain momentum in an era that sees entrepreneurship and globalization as critical issues in the world of business. Given the flourish of new research in this area, there is a need to provide an up-to-date perspective on the field and its future. 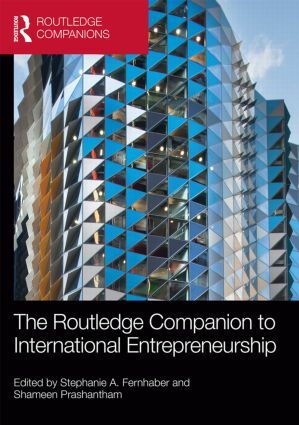 This volume draws together a team of experts purposely selected from both the entrepreneurship and international business fields to present a comprehensive resource on the cutting-edge conversations within international entrepreneurship. This prestigious reference book will offer students and researchers an introduction to leading scholarship in international entrepreneurship and also serve as a catapult for future research. Stephanie A. Fernhaber is Assistant Professor of Management at Butler University, USA. Her research focusing on international entrepreneurship has been published in the Journal of International Business Studies, Strategic Management Journal, Journal of Business Venturing and elsewhere. Shameen Prashantham is Associate Professor of International Business and Strategy at Nottingham University Business School, China. His research on international entrepreneurship has been published in Entrepreneurship Theory and Practice, Journal of International Business Studies, Journal of Management Studies and elsewhere.